Tag your collar with your dog's ID info or a fun tagline! 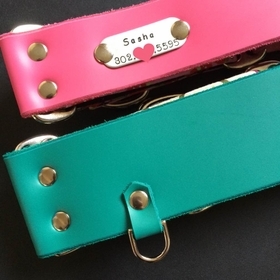 Reduce the number of tags or their noise by adding a permanent tag to your dog's collar. This will also help ensure important ID or other info would be available even if your dog lost their tags! Stainless steel and brass tags.